You are here: Home / Amazing Tips / Are Packaged Noodles Bad for Health? Are Packaged Noodles Bad for Health? Packaged or instant noodles are delicious in taste to but they are harmful for your health, particularly because their high sodium content. Furthermore, they contain trans-fats and do not offer proper nutritional benefits. These dried or precooked noodles are usually available with seasoning. Their shelf life varies from four to 12 months. Whether fried or non-fried, these noodles are high in carbohydrate and low in vitamins, minerals, and fiber. Let’s discuss in detail as to why packaged noodles are unhealthy. Plus, being high in sodium, they are bad for your health as excess intake of sodium increases the risk of developing health problems such as high blood pressure (hypertension), heart disease, kidney disease, and stroke. This highly processed junk food contains food additives such as sodium polyphosphate, Monosodium Glutamate (MSG), tertiary butylhydroquinone (TBHQ), etc. The Codex Standard for instant noodles allows the use of almost 136 additives in the manufacturing of packaged noodles. Of these, 24 are mainly sodium salts. Thus, they contribute to high levels of sodium in the products. On an average, instant noodles contain about 800-900 mg of sodium. Typical cup noodles, in particular, contain as high as 2700 mg of sodium. According to the Dietary Guidelines for Americans, it is recommended to keep one’s daily sodium intake within the limit of 2300 mg a day. Individuals aged 51 or more should restrict their daily sodium intake to up to 1500 mg. They body requires sodium for functions like maintaining healthy electrolyte balance and blood regulation in the body. In addition, it helps regulate muscle contractions, assists in the transmission of nerve signals, and facilitates glucose absorption in the cells. Hence, it is essential for the body but in small amounts. Excess sodium promotes water retention in the body and increases blood volume, thereby putting more stress on the heart and pressure in the arteries for circulating the blood. Certain additives like MSG (a flavor enhancer) included in most processed foods are also associated with an increased risk of cancer. In addition, MSG or monosodium glutamate is linked to higher chances of developing neurological disorders such as Parkinson’s disease and Alzheimer’s as well. Though rare, yet some people are even allergic to this chemical additive. Allergic reaction to MSG constitutes symptoms like headache, sweating, nausea, chest pain, heart palpitations, burning in the face, neck, etc. Besides, other artificial and chemical ingredients including anti-freeze substances such as propylene glycol (prevent the noodles from drying) are also associated with cancer. Propylene glycol also weakens the immune system and has an adverse effect on the heart, liver, and kidney. Packaged noodles are good in taste but lack nutritive value. This junk food is high in carbohydrates and fats that offer little health benefits. Deep fried noodles, in particular, are loaded with total fats and saturated fats that increase the risk of developing heart disease (saturated and trans fats raise blood cholesterol levels and clog the arteries) and promote obesity. Furthermore, these noodles do not contain fiber and proper vitamins and minerals. There are other rumors, too. For instance, it is believed that packaged noodles contain wax coating. However, this is just a myth because most noodles are fried in palm oil so that they do not stick together. Also, the disposable containers in which noodles are packaged also do not contain wax as they use polyethylene coated paper. 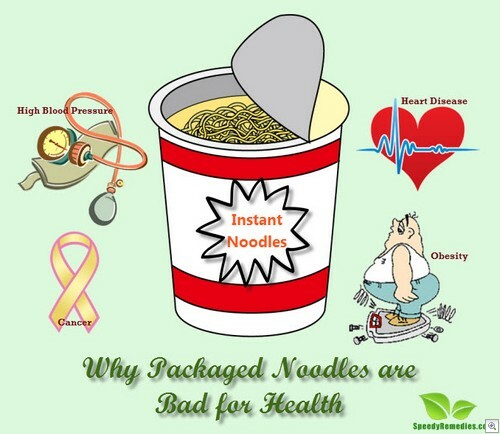 In addition, it is believed that packaged noodles contain substances that decrease the body’s ability to absorb nutrients from healthy foods (especially in children) and affects the process of digestion adversely. Regular intake of this junk food also affects the metabolism. Cup noodles pose further health risks because of their plastic containers that may release harmful substances in the soup after the addition of hot water. It may cause dioxin and other hormone-like substances to seep in the soup. Dioxins are highly toxic. They can interfere with hormones, cause reproductive problems, and even cancer.